In addition to world-class skiing and snowboarding at Timberline, there is so much to enjoy on Mt. Hood in the summer. From hiking the Pacific Crest Trail to catching a ride up to the 7000' level of Mt. Hood, discover all the other fun and thrilling activities Mt. Hood has to offer. One of our most popular summer activities is a ride on the Magic Mile Chair Lift to the mountain’s 7000′ level – no skis or snowboards needed! The spectacular view of Mt. Hood, Palmer Snowfield and nearby Mt. Jefferson is one you’ll never forget. Allow 30 minutes to ride up and ride down, or two hours if you choose to ride up and walk down. Spend as much time at the top of the lift as you like before returning to the Lodge. However, for tickets purchased within 30 minutes of closing, this option is not available. There is still snow on the mountain and the temperature can be cool on Mt. Hood, even in the summer. Please dress appropriately for current weather conditions. The Magic Mile Sky Ride is closed for the season. Timberline is home to the most energetic summer snow scene on the planet. Everyone from Olympic athletes to up-and-coming racers to freestyle enthusiasts descend on our Palmer Snowfield between the months of June and September. Much of the terrain is reserved by various camps and organizations, but we always maintain open areas to the public so intermediate and more advanced skiers and riders can enjoy summertime turns on the South slopes of Mt. Hood. Please note, Summer Camps and public use are assigned specific lane space daily. Each day, as Summer Camps leave the hill and vacate their lanes, that space is then opened to the public. The Palmer Express chairlift gives Timberline the longest ski season in North America. We wish it was possible to maintain the Palmer Chair during the winter – but frequent and heavy winter storms coat the lift towers in thick snow and ice. These storms often have wind speeds exceeding 100mph and brutally cold temperatures. These factors make de-icing the lift virtually impossible. In the spring, Palmer Chairlift gets a full maintenance check to prepare it for summer operations. Timberline offers the longest ski season in North America. In ideal years, lifts are open October through August, with maintenance scheduled for each September. Skiers, snowboarders, and sightseers ride up the Magic Mile chairlift to the Palmer Glacier and its lift, where most of the summer skiing takes place, particularly later in the season. In contrast to winter operations when weekends are the busiest, the lifts are the thriving during the summer ski season Monday through Friday, mostly due to ski and snowboard camps. Intermediate and more advanced public skiers and snowboarders are welcome on Palmer as well. Catch a bus ride in Government Camp up to Timberline* to ride the exhilarating Timberline to Town Trail. You and your bike can get a lift up to Timberline on the Mt Hood Express bus to access the US Forest Service Timberline to Town Trail for a great mountain biking experience. This flow trail drops 2,000 feet over 5.5 miles from Timberline Lodge to Crosstown Trail. To access the Timberline to Town Trail, ride or walk your bike through the upper parking lot of Timberline Lodge, past the swimming pool and amphitheater on your right, and the Magic Mile lift on your left. Start on the Mountaineer/Timberline to Town Trail on your left. *The only trail open to biking at Timberline Lodge is the Timberline to Town Trail, which is a US Forest Service Trail and not affiliated with Timberline Lodge itself. Timberline Road is not appropriate for cyclists. While there is still much planning and work to do, we have set a course toward offering a premium lift-serviced mountain bike park and trail system at Timberline. Sitting amidst the Mt Hood National Forest, Timberline Lodge is a breathtaking starting point for hiking trails around the mountain. With hiking trails that begin right outside the lodge doors and dozens of scenic Oregon hikes within a short drive, there is a hiking trail for hikers of all skill levels. 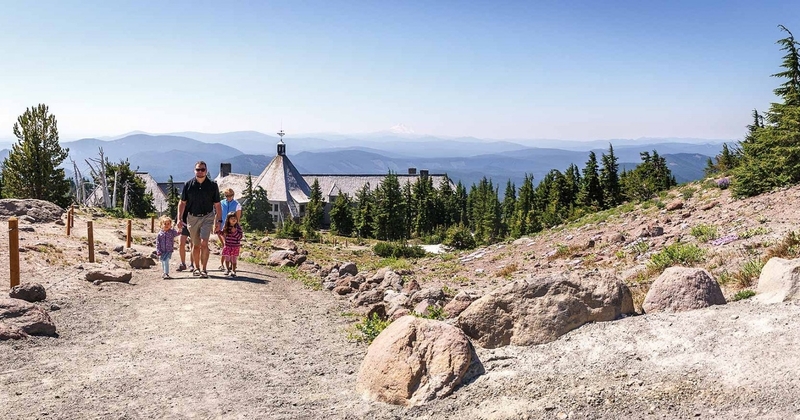 Timberline Lodge has easy-going hiking trails accessible around the lodge for our overnight guests and day visitors to enjoy throughout the summer (weather permitting). For a slightly more challenging hike, you can walk a mile up Mt Hood and enjoy the views from Silcox Hut and the Palmer chair lift. For a complete list of hikes throughout the Mt Hood National Forest, view the interactive map at Northwest Hiker. The Pacific Crest Trail spans 2,650 miles from the Mexican border to Canada. Timberline Lodge intersects the PCT and makes for a welcome oasis and resupply station for thousands of PCT hikers all summer long. Whether you're hiking the entire PCT or a segment of the trail, stop in at Timberline Lodge for a hearty meal, a shower, and to restock for your adventure. Please mark PCT across the sides of the boxes to assist in identification of the package as a PCT Resupply Package. It is also helpful if you add your approximate arrival date so that we can anticipate pickup of your package. Packages, letters, and postcards can be picked up at the Guest Services in the Wy’East Day Lodge seven days a week. Opening hours vary through the summer. Guaranteed hours are 7am to 3pm. Earlier opening and later closing is typically July and August, but can still be variable depending on visitor traffic. Package pick-up fee is $10 per package. There is no charge to pick up letters or postcards. We accept Visa, Mastercard, Discover, American Express, and Cash. There is an ATM machine in the Wy’East Day Lodge and Timberline Lodge. Timberline Lodge accepts packages via USPS, FedEx, and UPS. We recommend you use a service with tracking availability because Timberline Lodge is not responsible for any packages that are not delivered, or are mis-delivered. Please send your package early enough to arrive at Timberline Lodge before the hiker. Do not rely on 1- or 2-Day Priority Mail for your package to arrive in a timely manner. Timberline Lodge is unable to forward or return packages. We apologize for any inconvenience. For PCT hikers, a shower is available in the Salmon River Parking Lot. Restaurants include the Wy’East Cafe, Cascade Dining Room (with breakfast buffet and lunch buffet), and the Ram’s Head Bar. All are open seven days a week, hours may vary. The Wy’East Store sells snacks, camping food, and souvenir merchandise. Timberline Lodge is not responsible for any packages that are mis-delivered; not delivered; not clearly marked with hiker name; damage to packages; missing packages. It is your responsibility to ensure timely delivery of your package to Timberline Lodge, for it to be here upon your arrival. Please note that we receive many PCT Resupply Packages at Timberline Lodge. Receiving, logging, and retrieving packages can take some time, and visitor traffic to the Lodge in the summer is very high. We ask your patience during our busiest times. Please note that the Wy’East Store at Timberline Lodge does NOT sell camping gear – stoves, fuel, boots, hardware etc. Depending on availability, hiking apparel is sold at the Wy’East Store. Packages are held until early Fall. Unless the ETA indicates otherwise, packages will be sent Return to Sender in the first half of October. Packages without a Return to Sender address, or that have a store name, or a previous PCT Resupply box address, will be disposed of. Timberline Lodge reserves the right to refuse acceptance of any package that is damaged, leaking, or believed to be containing items that the Postal Services do not permit to be sent. The nearest major town is Sandy, 35 miles away. The Mt Hood Express bus services Sandy from Timberline Lodge. Smaller villages Government Camp, Rhododendron, and Welches are along the route. At 11,249 feet, the summit of Mt. Hood stands tall over the Pacific Northwest Landscape, a mecca for mountaineering. Getting to its peak is no easy task. Be prepared, go with Timberline Mountain Guides, and your reward will be nothing short of amazing. Because of snow levels, climbing Mt. Hood is recommended late April - July. Mt. Hood has an excellent variety of mountaineering routes to accommodate anyone’s interest. All are technical climbs requiring the use of ice axe, crampons, and ropes, as well as the knowledge of how to use them. Even the easiest routes on the mountain require steep, exposed, roped-in mountain climbing on snow. Contrary to popular belief, Mt. Hood is not a "walk-up" climb, so be prepared, get in shape, and have a fantastic mountaineering experience on Oregon’s highest peak. We highly recommend contacting TIMBERLINE MOUNTAIN GUIDES (541) 312-9242, before beginning your mountaineering adventure. Their guides have received professional mountaineering training through the American Mountain Guides Association, and all have wilderness-based medical training. In addition, they have decades of collective experience guiding on Mt. Hood, and strive to provide a fun, safe, and unique experience to their clients.